Jimmy lives in a small Caribbean town where there's not a whole lot to do. Fortunately though, there is a boxing gym, and one day the owner, Don Apolinar, suggests that Jimmy start training. He also gives Jimmy a cardboard box full of books and newspaper clippings all about Muhammad Ali. Jimmy reads and re-reads as he never has before. He is swept with admiration for Ali who said, "I am the greatest. I said that even before I knew I was." He starts to feel good, realizing that he doesn't need to have a lot of fancy stuff, that he's a pretty good boxer himself, and that he can look forward to the future. 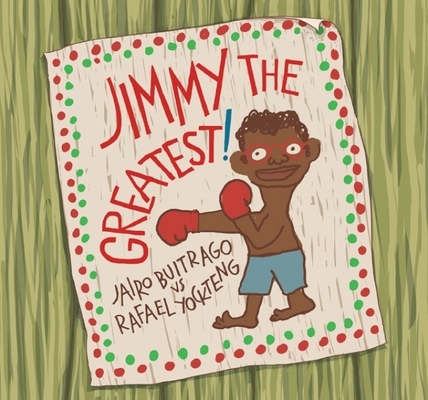 But by the time Don Apolinar has to leave for the big city, Jimmy realizes that he can have a great life running the gym, creating a library, dancing and boxing . . . right where he is. Jairo Buitrago's simple yet inspiring story is complemented by Rafael Yockteng's funny, expressive illustrations, making this a book that will speak to many young readers. The Spanish edition, Jimmy, el mas grande , was recently named one of "Los mejores libros del ano" (Best Books of the Year) by Venezuela's Banco del Libro. Jairo Buitrago is a children s book author who has collaborated with Rafael Yockteng on several picture books, and together they won the A la Orilla del Viento contest (Mexico). Buitrago has also been named to IBBY s Honor List.Rafael Yockteng was born in Peru, but has lived in Colombia for most of his life. He has illustrated many highly acclaimed children s books, including Sopa de frijoles / Bean Soup by Jorge Argueta (USBBY Outstanding International Books Honor List) and Mandaderos de la lluvia / Messengers of Rain, a bilingual anthology of Latin American poetry selected by Claudia M. Lee. He also won (with Jairo Buitrago) the A la Orilla del Viento contest, organized by Fondo de Cultura Economica de Mexico. " "Who was Muhammed Ali? Jimmy read and re-read the books and clippings . . . His mother was surprised to see Jimmy reading and shadow-boxing at the same time."